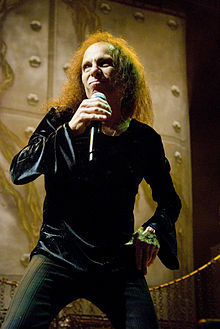 Ronald James Padavona (10 July 1942 – 16 May 2010), more famous as Ronnie James Dio, was an Italian-American rock musician, who wasa a vocalist in the bands 'Rainbow', 'Black Sabbath', 'Dio', and later 'Heaven and Hell'. From "A 39 News Interview in Houston"
We always seem to begin or end in Philadelphia, it's the best place to start and the best place to stop. You're fantastic. My favorite place. Thank you! From "Dio's Live At The Spectrum"
This page was last edited on 25 July 2018, at 20:02.